Pearl Buck wrote of this character in All Men are Brothers. "Wu Yung said, 'These three are brothers and they live... in the Village Of The Marble Tablet. Ordinarily they are fishermen by trade. Formerly they... were salt smugglers. Their surname is Juan, and they are three brothers. One is called The God Of Swift Death, Juan The Second; one is called The Short Lived, Juan The Fifth; and one is called The Fierce King Of Devils, Juan The Seventh [our man].... although they were not men who knew books, yet I observed that they were ever willing to be friendly and to help others. They were goodly fellows..." Wu Yung set out to invite these men into a group of bandits. Something to keep in mind when reading about or researching individual heroes of the Water Margin is that each of them is known by numerous variations of their names and/or epithets. Below is a listing of some of these for this particular figure. and there are others, there are always others. 1)In Exhibition of Suikoden by Kuniyoshi, Jūzō Suzuki, Riccar Art Museum, Tokyo, 1979 No. 28 and Einbandrückseite in Farbe Kuniyoshi 1798-1861, Kunstmuseum Düsseldorf 1961 Abb. 3 u.a. 2) In full-page color in Of Brigands and Bravery by Inge Klompmakers, p. 73. 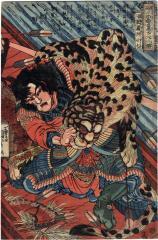 3) Kuniyoshi: The Warrior Prints by Robinson, 1982, #S.240. 4) In color in Samurai Stars of the Stage and Beautiful Women: Kunisada and Kuniyoshi, Masters of the Color Woodblock Print by Hatje Cantz, Museum Kunstpalast, #158, p. 186.